The French Alps boast hundreds of ski lifts, dozens of charming towns and villages, spectacular scenery, and Mont Blanc, the highest mountain in the Alps and indeed the highest in Europe west of the Caucasus. Whatever you want in the way of skiing and snowboarding, it's here. 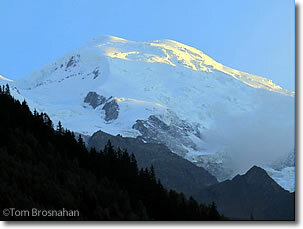 Mont Blanc at sunset, from Chamonix.